Also known as the “lazy girl’s braid.” More about that later. I managed to blast my writer’s block yesterday after a walk around the Loop and a trip into Loft. They’re starting to bring out some of their fall items and I love this striped shirt. It also comes in navy or gray stripes. In addition, I want to share a few pieces from Jess LC’s new Ainslie collection! I saw the pieces in person a few weeks ago and they’re so pretty! A bit delicate and can be dressed up or down. I decided to dress them down. 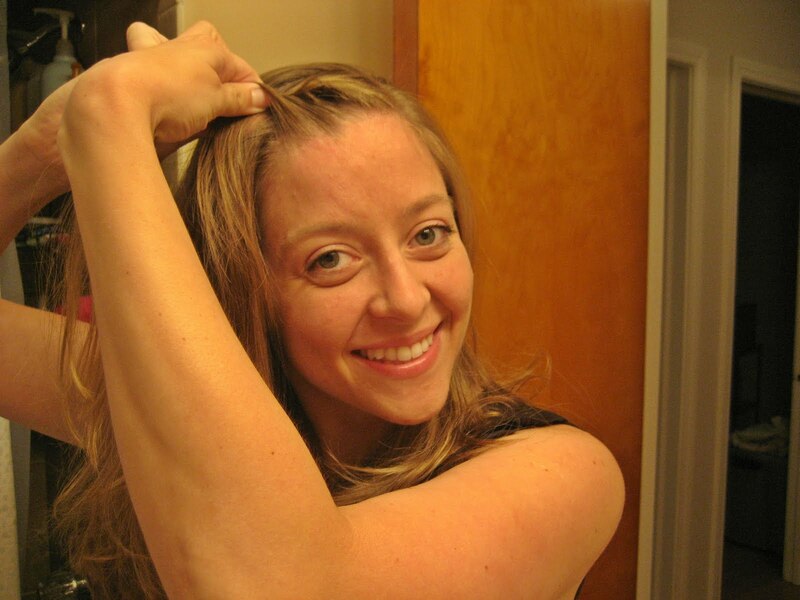 In addition to the dressed-down clothes, I’m going to show you some easy dressed-down hair…with a twist. Some girls seem to have the “hair and makeup” gene. Their hair is always perfectly placed and their makeup is never smudged. I, on the other hand, inherited the “cooking and baking” gene, which is OK by me. Over the weekend, I realized that my bangs had grown out of control and I didn’t want to pin them up again. So I started experimenting. I tried to braid my hair, but that was less than successful. Then I started to twist my hair. It worked! Here’s a short tutorial for my “lazy girl’s braid.” This is perfect for when your bangs have grown out or you want to spice up day-old hair. My hair was easiest to twist when it was wet. 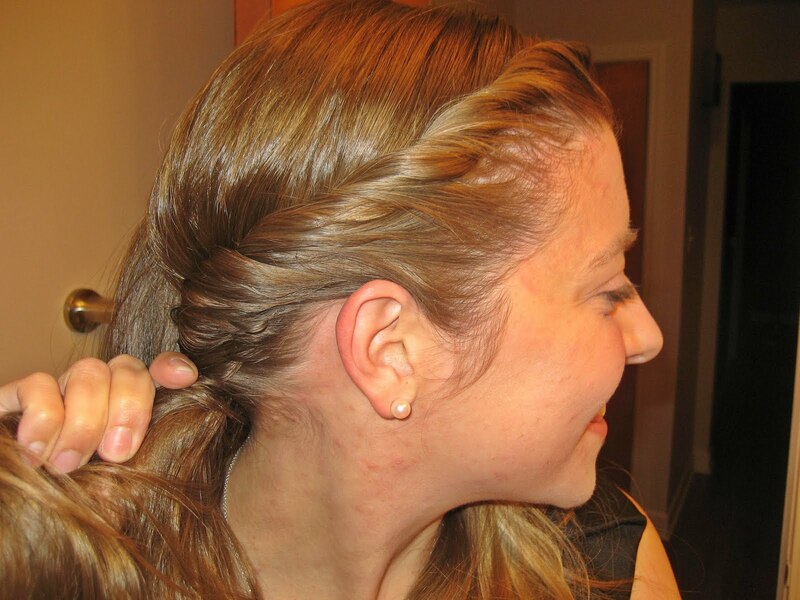 If you’re twisting dry hair, I would use some product to give the hair a little extra hold. 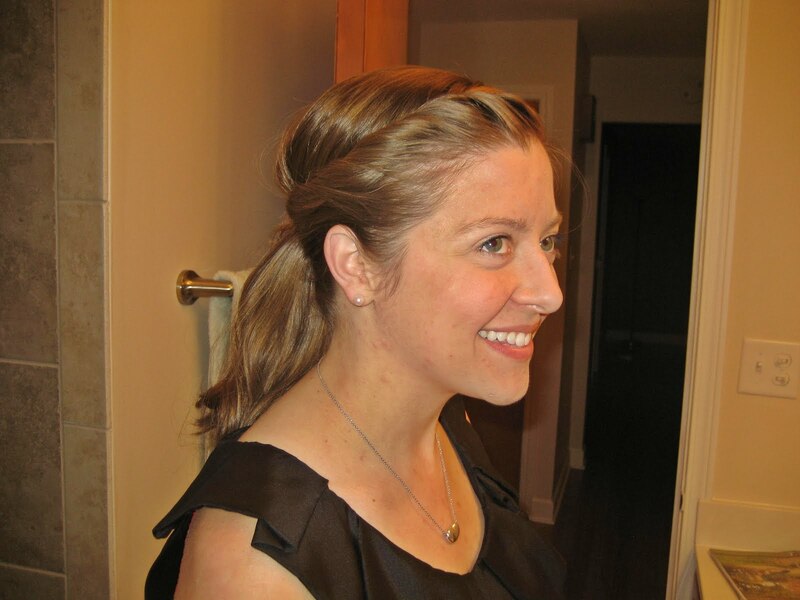 I used Aveda’s Phomollient styling foam for some light hold. 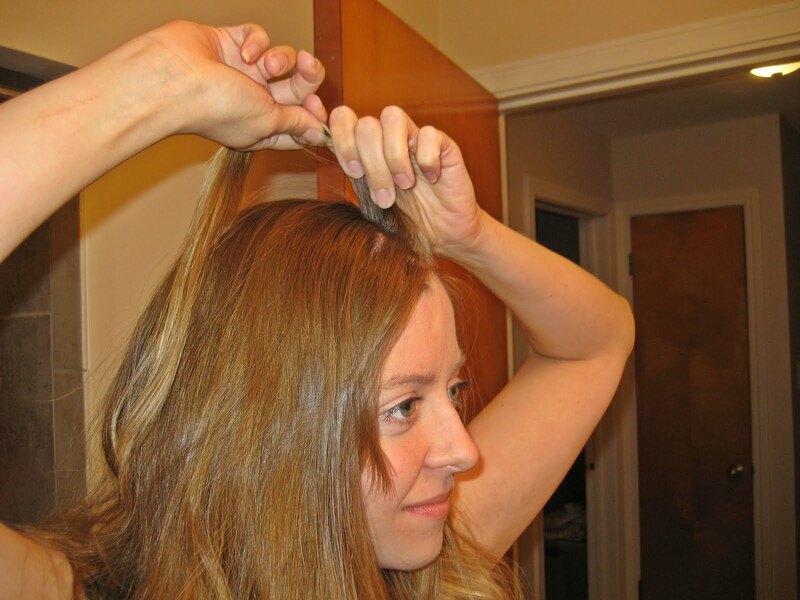 Part your hair to one side and grab a one or two inch section of hair next to the part. 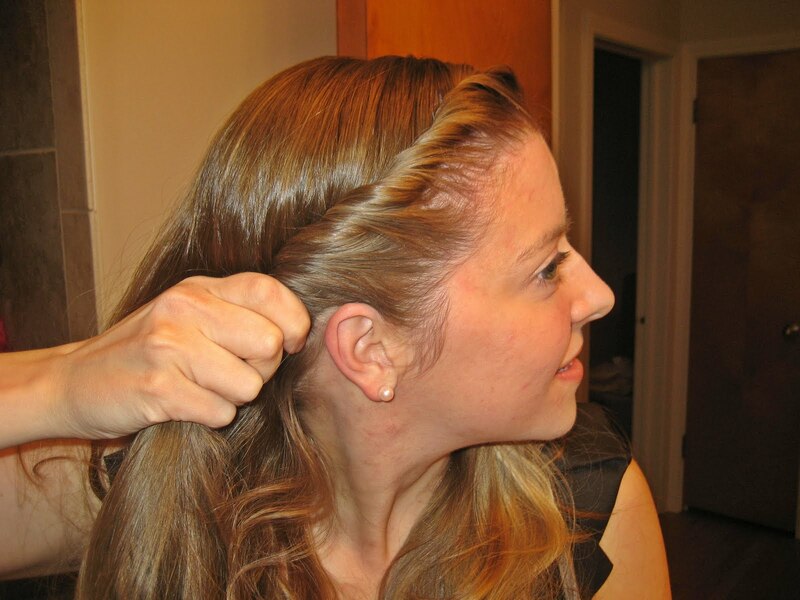 Start twisting the hair along the hairline, picking up small sections of hair as you go. I twisted towards the back of my head. Keep twisting until you make it to the back of your head. I stopped at the center. You could stop earlier depending on how you want to finish. I finished things off with a messy ponytail. There you have it! An easy summer look that keeps your bangs off of your forehead and still looks chic. Thank you so much for this advice. My bangs constantly get in the way so I’m definitely going the braiding route from now on. Nice work with the hair! How cute are you lady?!? I love those leopard ballet flats. They are too cute!! Love! Thanks so much for sharing the Ainslie pieces. :) They are definitely up your style alley. And that hair style, thanks for showing how, I want to do it myself this weekend! Love the hair!! I’ve been growing my bangs out for half the year and they have been driving me nuts in this heat! Will definitely have to give this a try. You had me at saving money and Aveda and stripes. Loving the stripes and leopard combo in your outfit!! and LOVE the side braid!! Need to try this on my own hair! Great hair tip!! 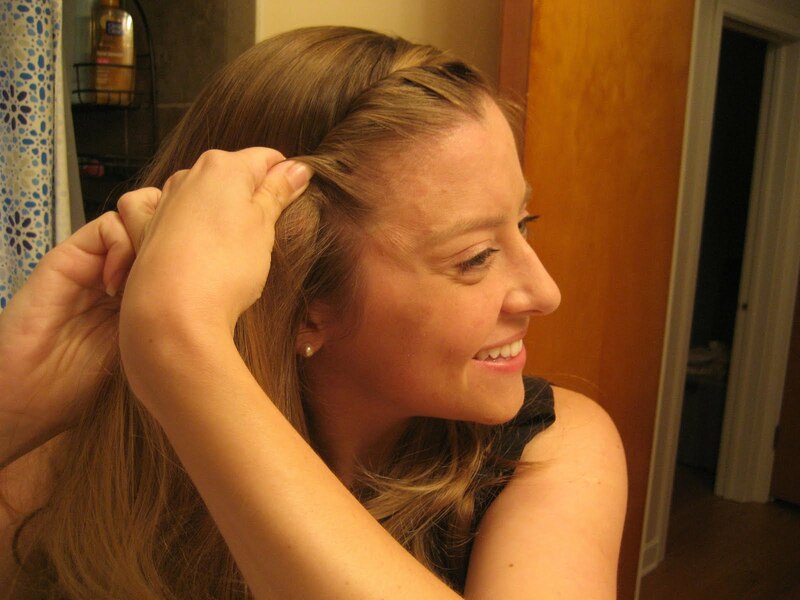 I sometimes do something similar but instead of going all the way back into a ponytail, I stop when I reach my ears and secure it with a few bobby pins. It’s super easy if you want to wear your hair down but your bangs just won’t cooperate! LOVE THIS :) Love your hair! Love your blog haha lots of love coming from over here. What a gorgeous ‘do! J’adore styles like this, especially in the summer!